I begin this post with a confession. I play the banjo. There, it’s out in the open and I feel better already. Actually, I play the tenor banjo in Irish style, although this is a distinction that probably only banjo players care about (but boy will they care). You’ll often find me on a Sunday afternoon in the Vat and Fiddle, Bell or Hop Pole playing along at one of Nottingham’s traditional Irish sessions. You would be forgiven for wondering what this has to do with human-computer interaction, but it turns out that even very traditional practices can shed new light on our interactions with computers. My colleagues Peter Tolmie, Yousif Ahmed and myself undertook an ethnographic study of Irish music sessions which, fortunately for me, involved spending some considerable time hanging around in traditional sessions and observing what goes on as well as interviewing musicians. At first glance an Irish music session is a traditional practice that seems far removed from the world of computers. 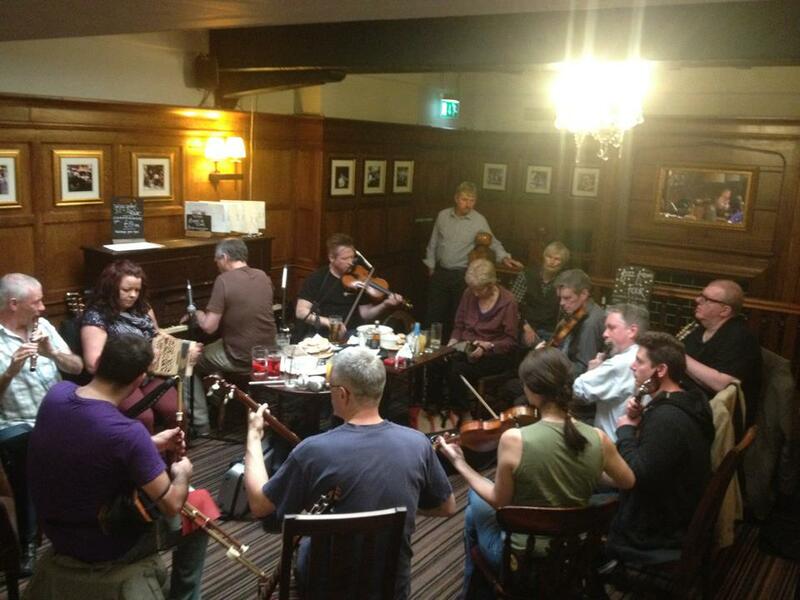 A group of musicians sits around in a pub, playing traditional tunes on a variety of instruments – fiddles, flutes, whistles, mandolins, the bodhran (the traditional Irish drum) and guitars to name a few. Even banjos are tolerated. Well, subject to recital of the canonical list of banjo jokes anyway. The structure of the music allows the musicians to improvise as a group. They typically play sets of several tunes that are strung together, with each tune being repeated several times. A typical set might consist of three different tunes, each repeated three times, and where each tune consists of two parts that are themselves repeated. If this seems a little complicated, the important thing to remember is that several tunes are sequenced together and that there is a fair bit of repetition. This structure enables improvisation, both through choosing which tune to segue into next as well as through embellishing a tune each time it is repeated. Repetition also supports playing by ear as musicians can try to recall a tune that they haven’t played for a while or even pick up a new tune from scratch if they are especially skilled. Our study showed how Irish musicians have taken to the Internet, establishing a dedicated Irish social media site called The Session as far back as 2002. Since then, a worldwide community of musicians has been transcribing the Irish repertoire, building a database of thousands of tunes along with sheet music, notes on recordings, names (which are widely contested), variations, playing tips and suggestions for good sets. 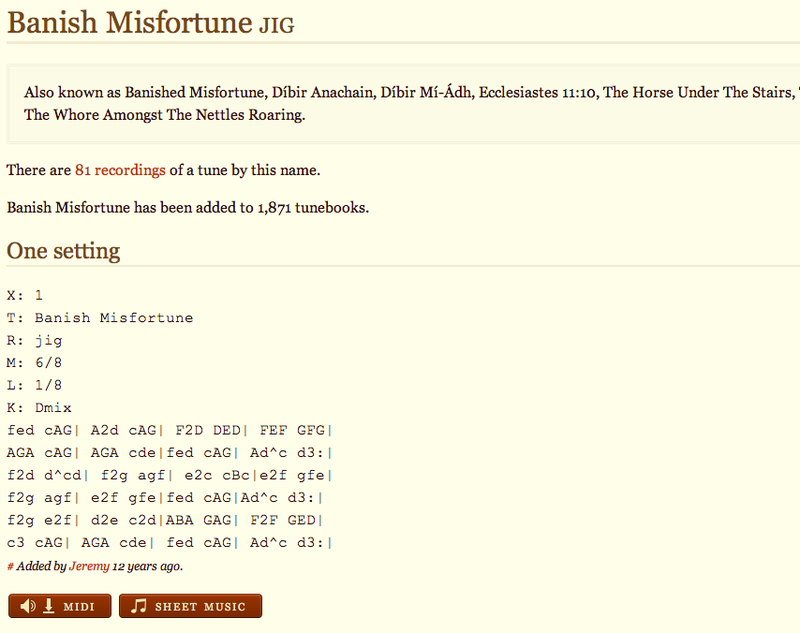 The picture shows an excerpt from the page for the tune Banish Misfortune giving alternative names, comments and also the music written our in ABC notation which has been specially developed for traditional music (the conventional ‘dots’ are also available). The Session also gives the locations and timings of sessions in many cities around the world in case an Irish musician is visiting a distant town and fancies a play. The Session is incredibly useful because it enables musicians to learn new tunes. It has since been supplemented by a variety of other services from YouTube, to the BBC’s Virtual Session to the specialist learning sites such as jigsandreels. There is a very interesting tension at play here – one that speaks directly to the design of new technologies. On the one hand, Irish musicians appear to be enthusiastically adopting digital media to establish a common repertoire of tunes, while on the other the actual performance of these tunes in a live session is governed by a strong etiquette that emphasizes the importance of playing by ear. While there are of course huge local variations in etiquette, many musicians we spoke to were very aware of the idea of this tradition of playing by ear. There is a general nervousness about getting out sheet music in a session, especially for beginners, an idea that is reinforced by various published guides to session etiquette. Our studies revealed the subtle ways in which musicians manage this tension, walking the line between extensive preparation and rehearsal away from a session, and the spontaneity of playing by ear within it. Many, for example, carry notebooks of tunes, pre-arranged into convenient sets. One notable strategy that we saw – and that I have seen several times since in sessions as far afield as Nottingham and Seattle – is to prepare a small piece of paper, perhaps in a pocketbook, that has the names of tunes grouped into sets alongside just the first few bars of music of each. These bespoke notations convey the essential information needed in a minimal form; an Irish musician needs to know which tune is coming next and just the first few bars of that tune so that they can segue into it, after which they are up and running from memory. Such pieces of paper are an example of a discrete technology. They condense the essential information required to support the practice of playing by ear into a form that fits with session etiquette. 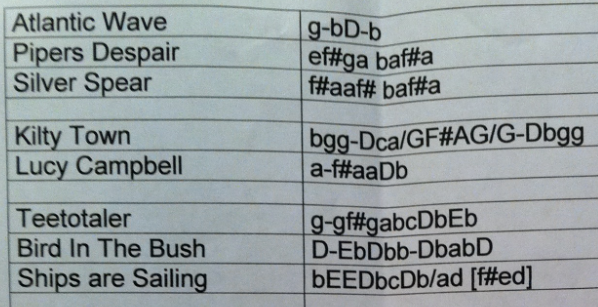 A page of a small notebook, which after all could be used for writing down the names of new tunes, contact details and so forth, is a long way removed from a piece of sheet music on a music stand. This idea of discrete technologies – ones that provide useful services in a way that respects the social etiquette of given situation – extends beyond pieces of paper to the digital world. We are all aware of the challenges of managing mobile phone use in various social settings. Indeed, these same technologies are present in Irish sessions that take place in pubs, busy social settings where people – including the musicians – have come together to chat, may even drink a pint or two, and enjoy ‘the craic’. In this context it may be quite acceptable to get out a phone, check a text or look up something on the Internet. It can even be be acceptable to break of playing in the middle of a set to check one’s phone or receive a call – quite a contrast to a formal classical music concert. We also observed people using digital recorders to capture tunes as they are played. So this notion of discrete technologies is a subtle one. Ironically, using a modern digital technology such as a mobile phone or digital recorder to support a traditional practice might possibly be more discrete that using a traditional technology such as a piece of paper. Both phones and pieces of paper can be used for many purposes, from taking notes to reading sheet music, and it is perhaps this apparent use that really matters. It all depends on how you are seen to use a given technology rather that on the form of the technology itself. Perhaps the underlying issue is whether the apparent use of a technology is sufficiently ambiguous that it can plausibly fit some socially acceptable use, or whether in contrast, it overtly flaunts the local etiquette to the point where it can no longer be ignored. This idea directly builds on Bill Gaver’s discussions of the role of ambiguity in interface design, and especially on Paul Aoki’s and Alison Woodruff’s subsequent application of this to the challenge of saving face in mobile phone calls. The challenge for interface designers is to invent displays and services that can be used discretely with respect to a particular social setting; that don’t overtly flaunt social etiquette and that are open to ambiguous interpretation. Our study showed how traditional Irish musicians had been particularly creative in this respect, inventing their own discrete notation to help them bridge between their learning of tunes offline and their ability to recall them when playing live. Interface designers might learn a great deal from such inventiveness! For those who would like to read more, our ethnographic study of Irish Music sessions was first reported in a paper at CSCW 2012 while an extended version has recently been published in the book Ethnomethodology at Play. Finally, it seems appropriate to end with one of my favourite banjo tunes – the rollicking jig Banish Misfortune that we saw earlier on. Feel free to play along, or perhaps I’ll see you in a session somewhere soon. Thanks Graham – much appreciated. I enjoyed the post and have shared it on our facebook group, East Midlands Irish Forum. You might be interested in some of the events run by Nottingham Irish Studies Group. Details on website.